The Artist’s Window -Creating Onsite vs.The Studio. There is a big difference in working on site, with all of the sensory input of the moment. Sound, light, colour, smells…they all ADD to the moment of rapture when creating the work, and for me as an artist, there is nothing quite like that pure energy of creating the “feeling” of what you have in that one moment and place. 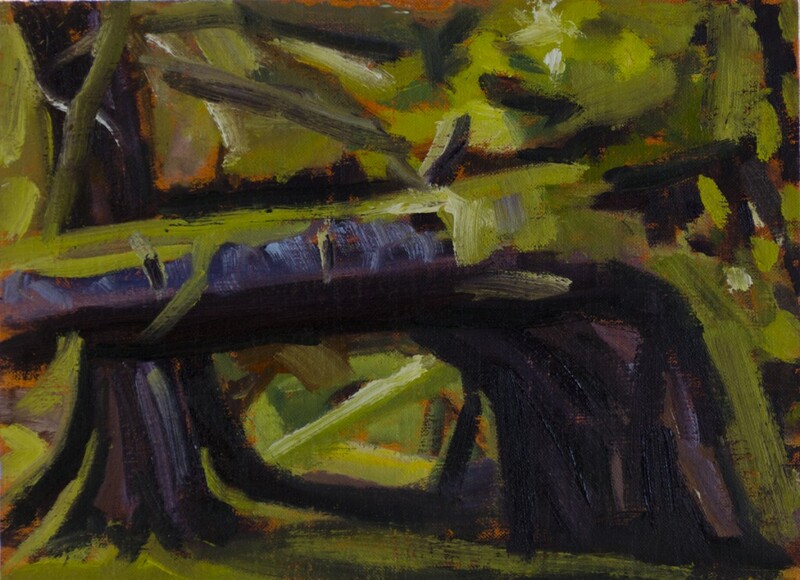 This painting, a small 6″x8″ work, was done alla prima, plein air on a secluded location near Marco Island in Gwaii Haanas. Nothing that I do to it can ever convey the moment – the smells, the calls of the birds, the feel of the mossy ground upon which I sat or the small black and yellow caterpillar that I remember crawled across the root of the tree where I sat. For me, this painting will always contain all of those sensory experiences. Even the sense of urgency that I would need in order to get the painting done in a timely manner to join my travel companions – these are all the things contained within this painting. Sadly, we can’t always be in all those places for the length of time that we desire. This was the case in Gwaii Haanas. There was so much to see, and I could have spent years just in one place on Haida Gwaii creating and painting what I felt, what moved me – the sights, the sounds and the spiritual supernatural that is ever-present. For completing this work, the studio is the best way to be able to continue to convey the feeling, the spirit and sense of the time spent in that place. As artists, this is our task, and it’s not always an easy one. This piece is a different “window” for me. It is the first piece that I created offsite from Haida Gwaii, and in the controlled space of the studio – a comfy chair, a bathroom, a hot cup of coffee in my hand and all the time in the world. 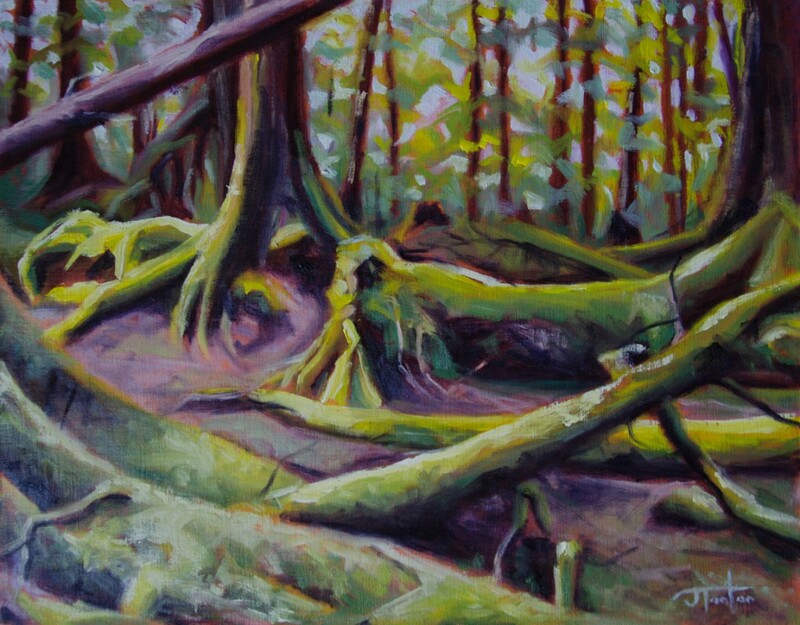 With decent photographic reference, I’m still not able to get a clear idea of the full colour range afforded by the jungle of Bag Harbour, or the life, the energy or the timeless urgency of the place. Having been there, I’m connected to the time that I had there, but the time it takes to snap a photo vs. sitting on the ground, feeling the energy, observing the colours for an hour or more and creating a work onsite are never the same. It’s still full of memories for me, and hopefully, I can open this window in my studio and let those feelings all spill into the painting. As an artist, do you prefer the studio or painting onsite? Why? What are the merits of both?